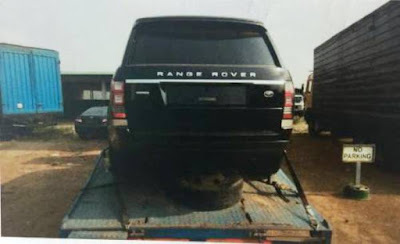 The N298 million bulletproof Range Rover Sports Utility Vehicle (SUV) reportedly belonging to the Senate President, Senator Bukola Saraki, is rotting away at the Nigerian Customs Service (NCS) yard, nine months after it was impounded. Sources including officials of the Customs Service in Lagos State said the vehicle which was seized in January this year, is at the facility of the Federal Operations Unit (FOU) Zone A of the Customs in Ikeja. Daily Trust on Sunday gathered that the car which the Senate in March claimed it bought at N62.5 million, is on a crane at the entrance of the yard. It was gathered that the black SUV, with chassis number SALGV3TF3EA190243, is being held over evasion of Customs duties and fake documents. A source sighted the vehicle at the yard last Thursday when an official of the NCS facilitated his entry. “A senior Customs official showed me the car when I went there for my personal business. I couldn’t take a photograph of the car because we handed over our phones at the entrance to officials manning the gate,” he said. Also, a Customs officer serving in Lagos, said the car has not been released and that it has become, “government property”. “I can confirm to you that the car is still at FOA in Ikeja. You know if you bring a contraband or you evade Customs duty, it’s classified as seizure. Any car that is impounded becomes government property. “When an item is seized it can either be auctioned or destroyed. I don’t know whether there is an arrangement to auction the car or not but what I know is that it has not been released, “the Customs officer, who pleaded anonymity, said. When contacted, the spokesperson of the Senate, Senator Aliyu Sabi Abdullahi, said,” I have no comment on that because I don’t even know what you are talking about”. Asked whether the contractor has returned the money paid by the Senate, Sabi said, “I don’t know anything about that. Go and do your investigation. I have come to the conclusion that you people in your paper don’t want peace, otherwise, how has this become an issue? At the peak of the controversy, Sabi, while addressing newsmen, confirmed the purchase of the car. “Our attention has been drawn to the various false and mischievous reports in the media about the price of the vehicle which the Senate was said to have bought as part of its convoy but was later abandoned when it got impounded by the Customs over the controversy surrounding import duty payment. “The correct price of the vehicle when it was imported in 2015 is $298,000, which at the prevailing rate of N165 to a dollar is about N49, 170. The Senate paid N62.5m for the vehicle in November 2015. This is contrary to the mischief by those who decided to turn the $298,000 to N298m as the price of the vehicle. For the avoidance of doubt, the price of that vehicle is N62.5m and not N298m,” he said. The news of the seizure of the car was unknown until the Comptroller General of Customs, Hameed Ali, clashed with the Senate over wearing uniform in March, two months after the car was impounded. The car was intercepted and impounded by Customs operatives in January, while it was being moved to Abuja from Lagos by operatives of the Customs. The driver of the car was said to have presented documents, including a letter from the National Assembly, indicating that it belongs to the Senate President. At a public hearing in March, the importer, Tokunbo Akindele, told the Senate committee that it was discovered in January, this year that the car had fake documents. He said the car was not imported for Senator Saraki, insisting that at the time the vehicle was imported, it was not for the Senate President’s use. Meanwhile, the Customs authority in charge of the Federal Operations Unit (FOU) Zone A, Ikeja, has maintained sealed lips on the issue. Our correspondent gathered that the case file has since been transferred to the Customs Headquarters in Abuja, for further investigation. The units Public Relations Officer, Jerry Attah, did not respond to messages sent to him on the issue, just as calls put through to him were not returned. A whole lot more rotting in that place.